In Feb 2017 I bought my last note, bringing my total 9016. I haven't sold any since that time. 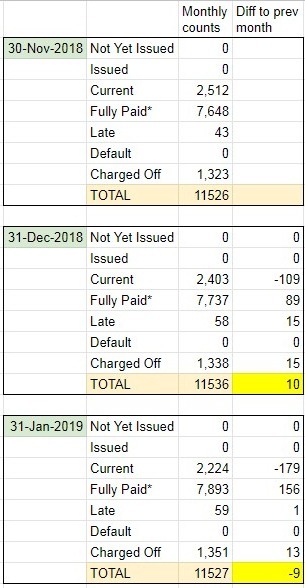 My statement in Jan 2018 showed a total of 9015 notes, so one went missing entering the new year. I just received my Jan 2018 statement and it shows a total of 9010 notes; 5 more went missing entering this new year. This was discussed on the forum before but I don't know where. i have no idea and am a newb - do they stop counting charged off ones though? I thought some were 'repurchased'. You can do a search for that word and find some threads. HTH Hmm ... or did they just cancel some and refund. I can't recall. Also tax guide changed as I pointed out in a new thread the other day. I think it may have been for this. At least 'repurchased' was mentioned in the new guide. Not sure I made it clear but I monitor my portfolio on a monthly basis. My total number of notes is constant Feb - Dec, but the past two years the January total number of notes dropped from the prior December. It's an end of year thing. There doesn't seem to be any special payment, etc. to indicate I'm receiving my principal back for the missing notes. Could be lumped in with "Principal Received" but that amount is in line with my expectations without any added money. If the amount is small I couldn't tell. The only thing that looks a little screwy is the change in the number of charged off notes. That's definitely lower than expected, by about the 5 that went missing. Should have been 13-15 and it was only 8. Seems the notes are going from charged off to missing. what did support say ? My bad. My note count has changed the past couple months. Up and then down. Not sure why notes are in purgatory at different times. For me it doesn't seem like a big enough deal to spend the time with customer support on it. Doubt it's a common question with a ready answer. I posted to make others aware; some may have more than a handful of notes involved and may decide it's worth their time to address it with LC.